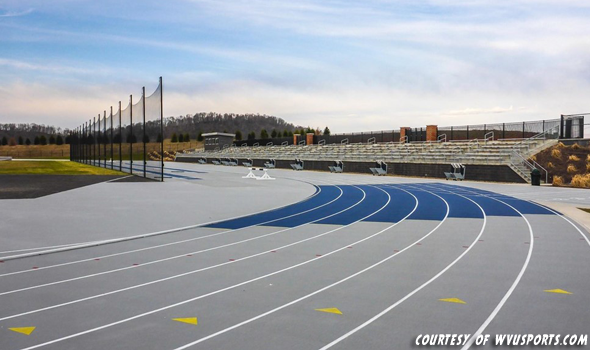 MORGANTOWN, W. Va. – The West Virginia University track and field program will usher in the future as it hosts the West Virginia Open this Saturday at the new Track & Field Complex at Mylan Park, the Mountaineer’s first home meet since the 2009 season. The university worked with the local Monongalia County community to build the new facility which is part of a larger project. The school will be the primary paying tenant with a large portion of the schedule going to local athletes like surrounding area high schools. The purpose of the facility is to be a community one that will benefit the county while attracting athletes from neighboring areas. The new complex features an eight-lane track, grass area for infield events, seating for more than 1,200 spectators, public restrooms, a press box and a state-of-the-art electronic scoreboard and timing system. To go with the track and field venue, a $35 million aquatic center is currently being built next to the track along with other various renovations throughout the park. Saturday’s event, which will include teams from Bethany College, Waynesburg, West Liberty, Wheeling Jesuit and Robert Morris, will be the first competitive meet at the new facility since it officially opened in October. To say that the Wolverine program is thrilled to stay in Morgantown is an understatement.